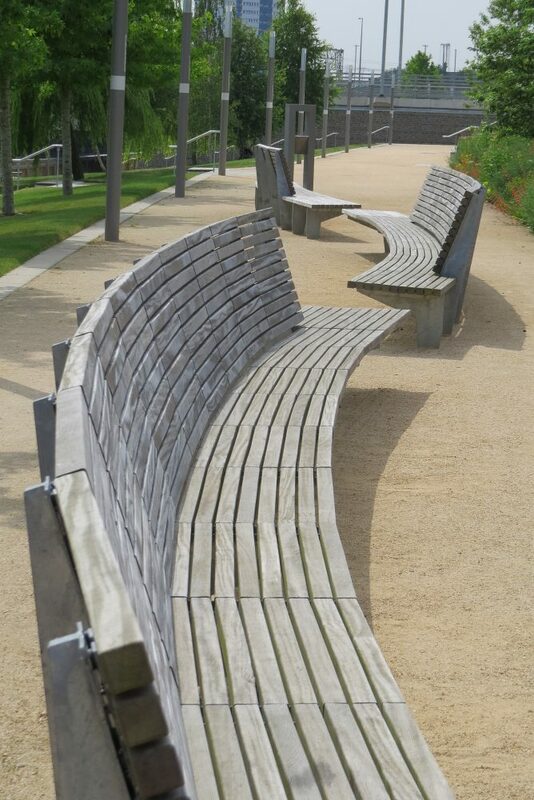 Queen Elizabeth Olympic Park – ‘If you haven’t got vision, you very quickly degrade the landscape’. ‘If you haven’t got vision, you very quickly degrade the landscape’. 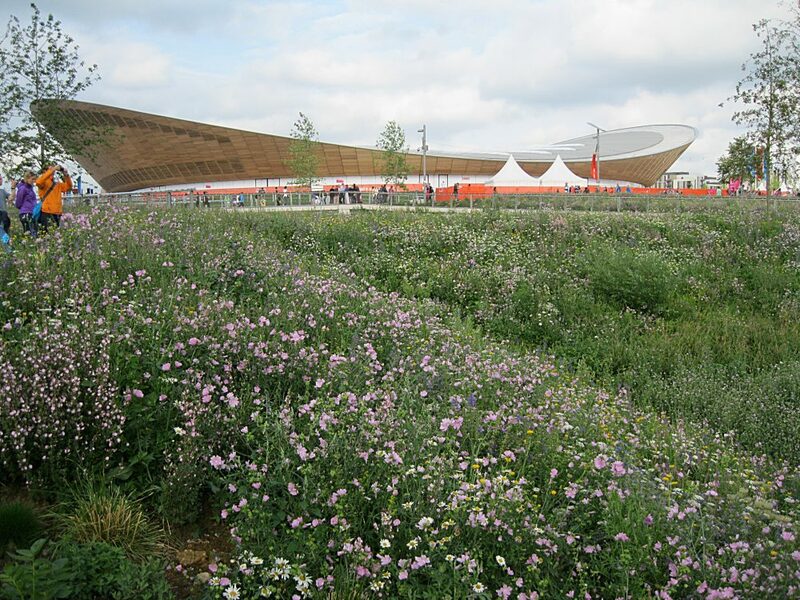 These were the prophetic words spoken five years ago by James Hitchmough the designer of much of the landscape planting at the 2012 Olympic Park (now renamed the Queen Elizabeth Olympic Park), when asked how he saw the park in five years time. London’s success in bidding for the 2012 Summer Olympics and Paralympics was met with equal measures of public enthusiasm and cynicism of those who looked at the crumbling sports venues of Athens and abandoned ones of Beijing and predicted doom and gloom. The London Mayor who had first proposed the bid, Ken Livingstone, said that the Olympics ‘was the only way to get billions of pounds out of the government to develop the East End’. 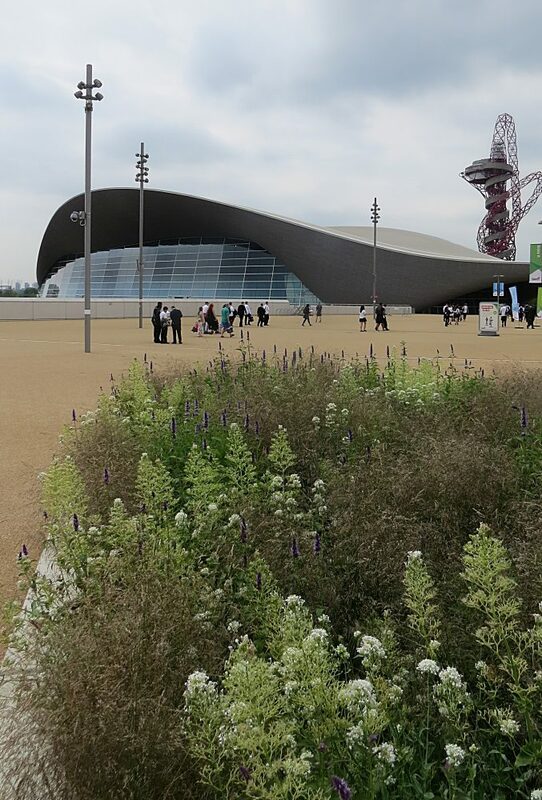 Fortunately London’s 2012 Olympic venues aren’t crumbling or abandoned, they continue to be regularly used for organised events and by local people. Regeneration is something that takes a longer lifespan than the gnat fly attention of the media but all indications now are of a modestly successful regeneration scheme. The ‘Cultural and Educational District’ and ‘International District’ are attracting such big hitters as a new campus for University College London, a branch of the Victoria and Albert Museum, Sadler’s Wells, Transport for London headquarters and The Financial Conduct Authority. More importantly the first of the expected 20,000 residents who have moved in, despite a few minor gripes, are happy and stay. 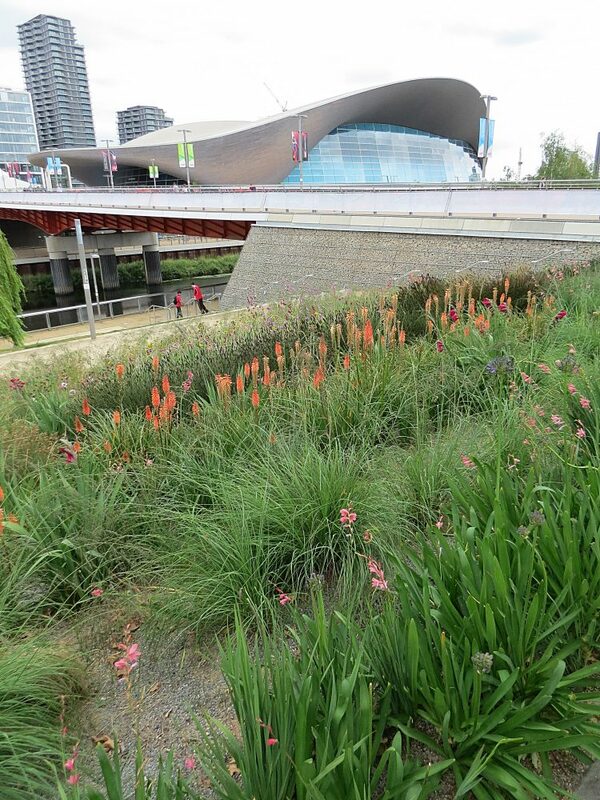 However, the replanting of the Queen Elizabeth Olympic Park is a less happy story. ‘Sustainability’ was the catch phrase for the 2012 London Olympics and the scale of the challenge can easily be forgotten. 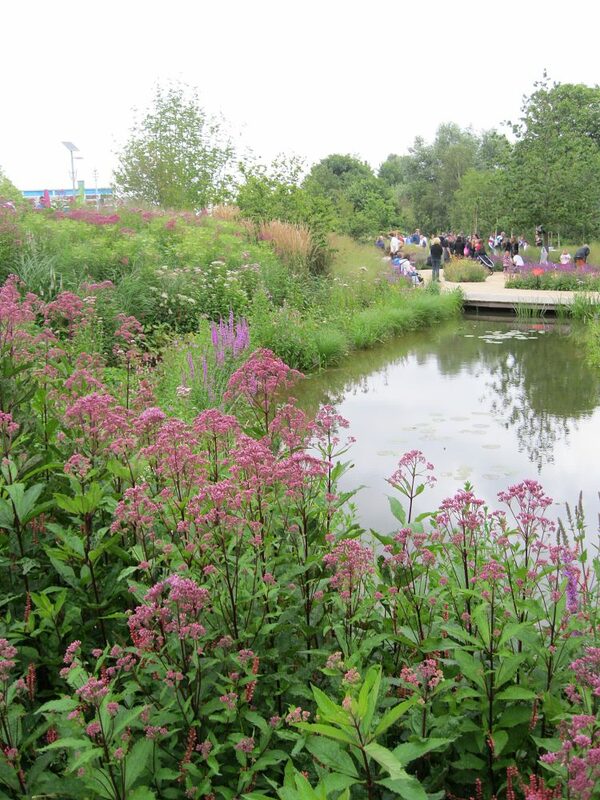 In creating 246 acres of public park (one of the largest in Europe for 150 years) 30,000 tons of silt, gravel and rubble had to be removed from the waterways, the shaped and moulded contaminated land of the brown field site capped off, and 2 million tons of soil cleaned for reuse. 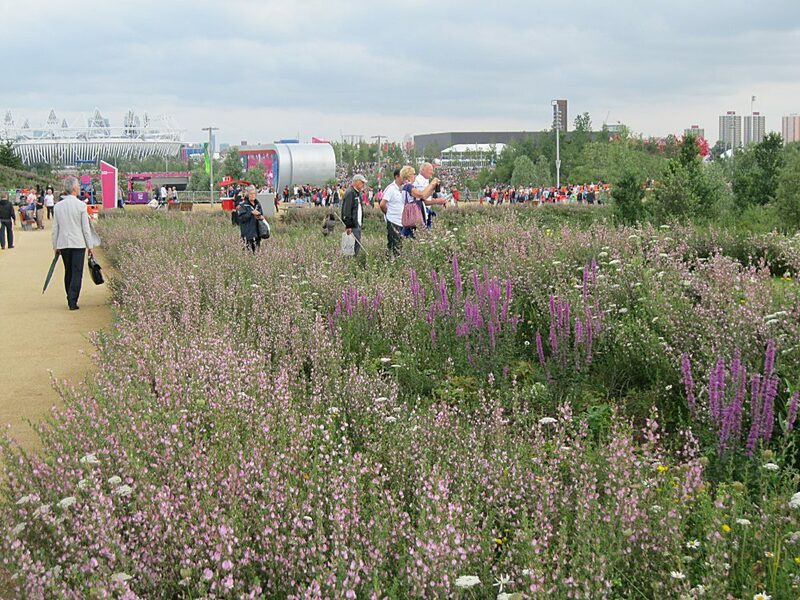 Whilst the Olympics and Paralympics were taking place the park was as much a destination as the venues, attracting 250,000 people a day both to enjoy the party atmosphere, amble, and watch the events on the giant screens. The high quality and well-designed modern hard landscaping coped well with these numbers but it also explains the sinking feeling I have visiting today; it seems like a deserted theme park with over-sized boulevards and infrastructure. Despite these shortcomings, it really is used by the local community. The Park divides into two; the South Park centred around Zahra Hadid’s spectacular Aquatics Centre with its pringle-shaped roof and the rather non-descript Stadium, and the North Park where water management alongside the River Lea is a key aspect. 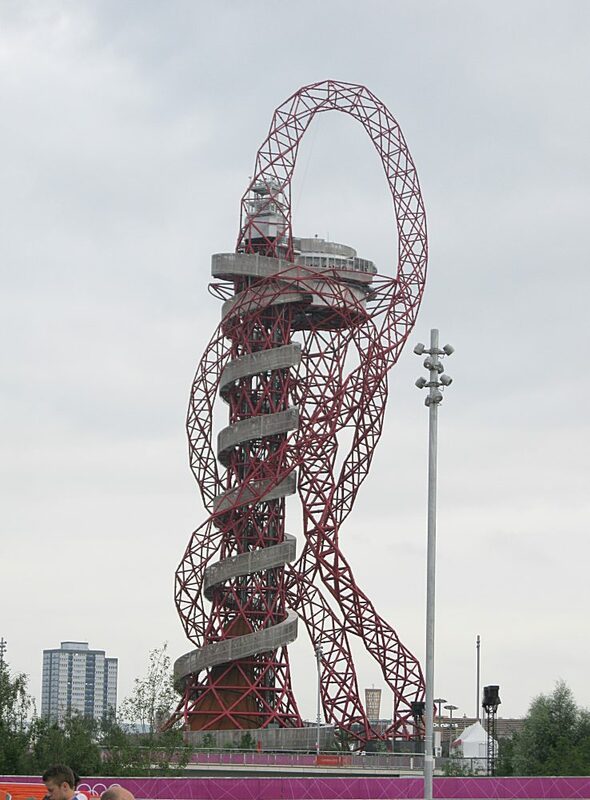 The two main landscape features of the South Park are Anish Kapoor’s giant coiling red sculpture, the Arcelor Mittal Orbit (a feature few want to visit) and the 2012 Gardens. These were designed as a succession of habitats from four climatic zones to underline the historical association of plants in the UK, firstly from Europe and the Near East (traditional hay meadows), then non-native species from the Americas (prairie planting), Africa (based on South Africa’s Drakensberg Range), and finally in the 19th century from Asia (woodland edges). To compare the two photographs of the South African planting taken five years apart demonstrates James Hitchmough’s point about degradation. Some species such as the dioramas, agapanthus, and knifhofias have survived in smaller numbers whilst grasses have flourished and spread, but overall it has lost its way. 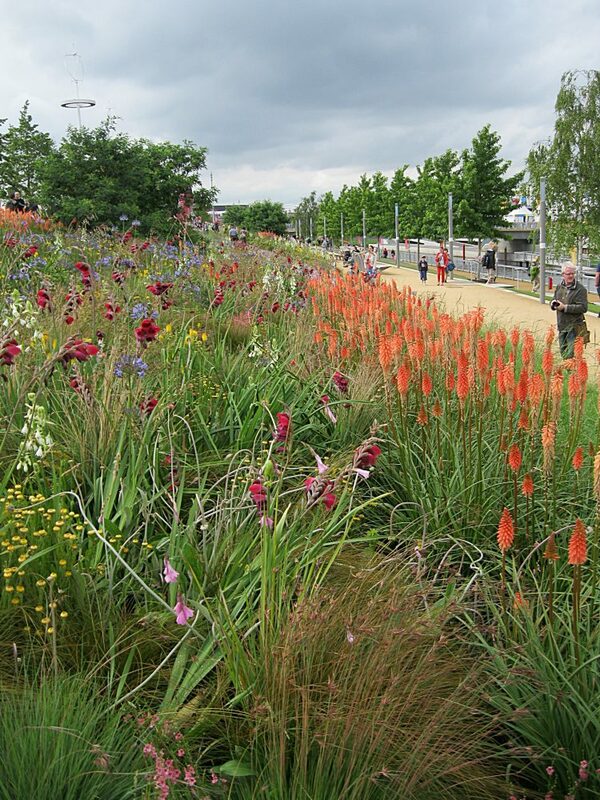 That said the 2012 Gardens were designed with intimate areas between large beds of perennial planting together with grassy banks beside the Waterworks River, both of which are well used despite the failing planting. 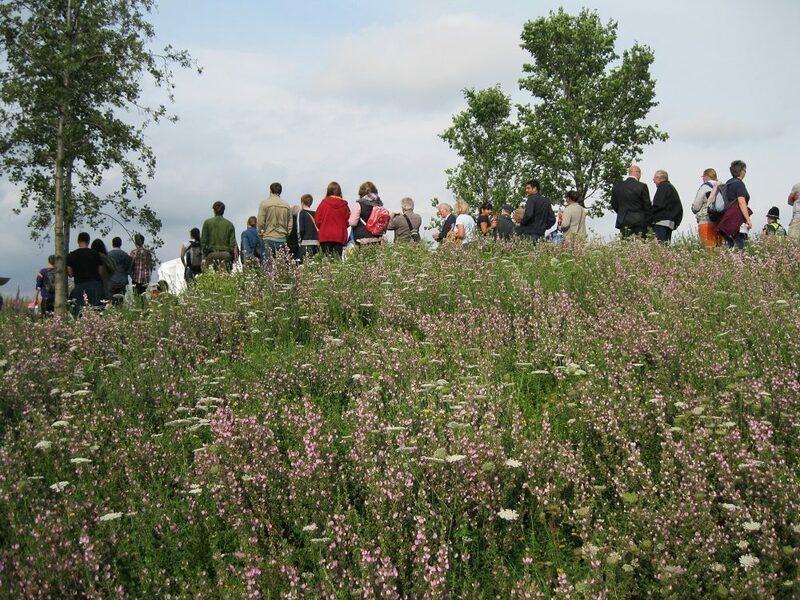 The most profound changes have happened in the North Park which was designed not as a traditional park setting with large areas of grass, perennial borders or carpet bedding but as an ecologically conceived alternative with meadows to be viewed rather than walked upon, small amounts of lawn, wetlands and wet woodlands created beside the River Lea, and planted swales to hold back storm water. Used as I am to modern designed landscapes that focus on texture and subtle shades of green (the restrained philosophy of less is more), the 2012 meadows came as an astonishing, spell-binding shock; a riot of colour and a radically different approach. This was an aesthetic approach to ecology where everything had been seeded in a lean mix of sand and composted wood fibre. There has been much elitist criticism in the garden press of the North Park meadows being ‘faux countryside’ but it is a vernacular style that excites and delights a broad range of the public. To achieve the perfect timing to coincide with the Olympics was a combination of great skill and luck. 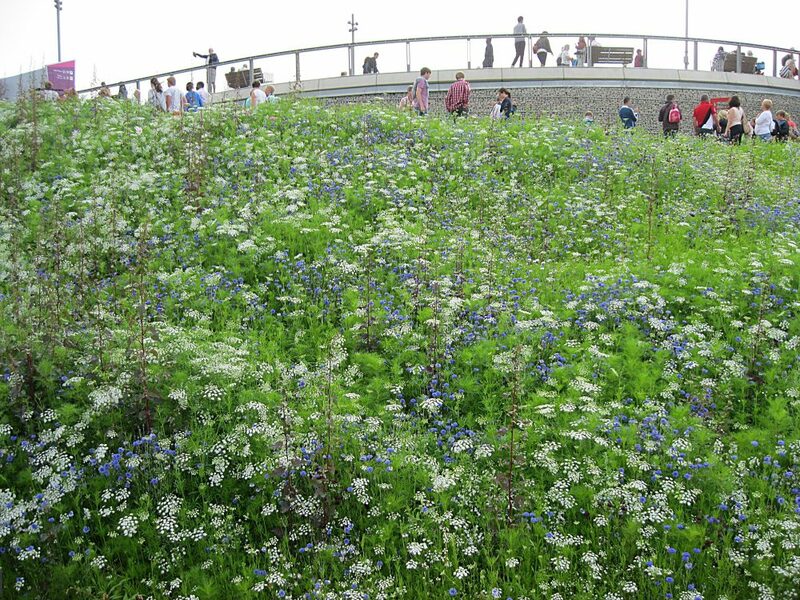 The plant mixes were trialled for years before, and the meadows cut in mid-May to delay flowering, and fortunately the wet summer turned to warm sunshine a week or so before the opening event, so the flowering was really at its best. Today, the North Park through seeding and replanting is no longer meadow but is not natural-looking grassland either. There are too many differing native and non-native species to the square metre and at the time of my visit there was an absence of summer-flowering perennials such as ox-eye daisies, scabious, and native cranesbill geranium that you would have expected. 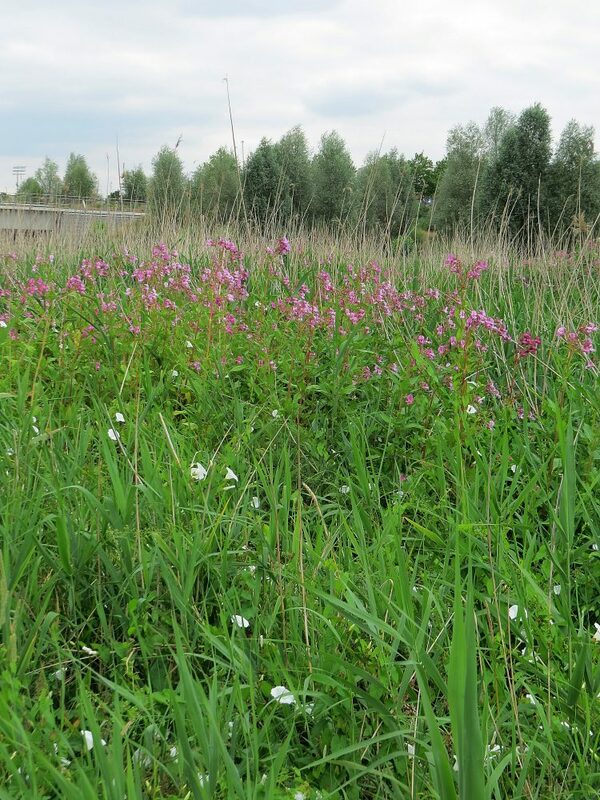 Only the Himalayan balsam, reeds and bullrushes in the wetlands have spread into large natural looking blocks. For the 2012 meadows James Hitchmough mentored and trained the maintenance contractors in new ways but five years on those new skills have been forgotten and that big budget gone. The eight full-time gardeners struggle to keep on top of litter, carry out additional watering of the 6000 maturing trees, and weed. The amazing vision is now a will o’the wisp memory and any sense of continuity has been sadly lost. 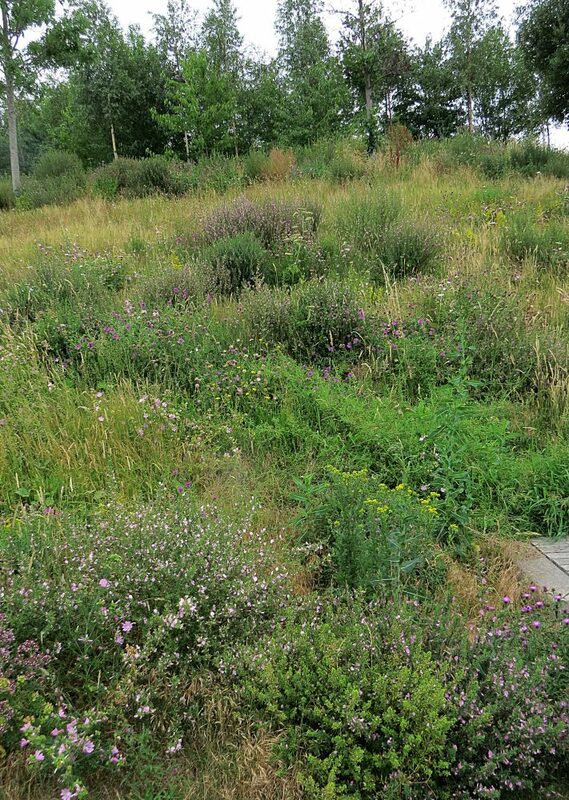 The local community have gained a spectacularly large park and the ecology, judged by the number of bees has improved beyond all measure, but that astonishing planting is a distant memory.